Most expensive car to maintain since Jaguar's Lucas days. 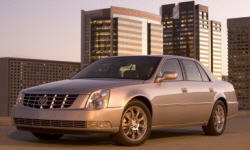 Why the 2006 Cadillac DTS? Very clean and comfortable. Fantastic seats! Can sit in them for hours without fatigue. Why Not the 2006 Cadillac DTS? City gas mileage is pathetic. Since new I was lucky to get 10 mpg in the city, but in stop and go it's 8 mpg. When the car was newer, I took it to the dealer, and they checked everything out. I was told that it's a big V8. The Northstar engine is an embarrassment. Despite numerous alignments, front tires wear unevenly. I'm tired of dealing with it. Nav is hit-or-miss. It will get you there...but might send you 30 miles out of the way in doing so. Seems to want to take me through every congested area and ghetto. Never again GM...NEVER! I've wasted more time and money at your clueless dealers service departments. Only one ever was knowledgable...North Bay Cadillac in Roslyn, New York. If going there, ask for Marino. The Northstar engine is a piece of junk. There are thousands of web pages killing it. How GM could continue to seel such a piece of crap is head-scratching. The engine is impossible to work on. To change a water pump takes 8 hours and costs almost $1500. Access is impossible. One caveat, parts do last. But when they go, forget about it...your child is going to community college instead of Harvard. You have to drop the engine and basically take most of it apart to replace the timing chains. How does $2300 sound to you? My engine just died. Gone! History! The car looks perfect inside and out. Yet I either had the choice to sell it for parts, or to a mechanic. Did the latter...for less than $2000. This is a vehicle that I paid over $45,000 for 7 years ago. GM will never get a nickel of my money every again. I emplore you...stay away from the 2006-2011 DTS. Sure they are smooth, large, and comfy. There is no reason to own this car, unless you like taking the bus or subway...and emptying your bank account.